As a kid, I wasn’t much into Star Trek, but I was fascinated by the idea of teleportation. It’s so elegantly efficient; I mean who wouldn’t want to skip all the transit time and instead just instantly arrive where you need to go? I was all about the destination, and would have been happy skipping the journey entirely. But you know what we find each time we get “there”? In mountain climbing, we call that a false summit. So what does this have to do with entrepreneurship and side hustling? This isn’t a call to stop and smell the roses, but it is a reminder that no matter where you are today in terms of your business, you’re on the path. You’re making progress; moving forward. Even the people who’ve supposedly “arrived” don’t see it that way, so you shouldn’t either. Now I’m all for setting goals. After all, if you don’t know where you’re going, how are you going to know how to get there? But I’m coming to see them more as milestones rather than endpoints, because the journey doesn’t stop there. And here’s the best part: since the journey is the destination, you get to choose your own adventure every day and embrace it as a destination on its own. After all, your whole life has led you to this day. Reframed through that lens, challenges and barriers that stand in your way become little mini-quests to conquer. That doesn’t mean it’s always going to be easy or fun (it’s not), but it does allow you to be proactive and positive about the journey. Have you heard this quote from Jon Acuff? There’s a reason he didn’t say “someone else’s finish line.” Because it’s all middle. Does that make sense? This new mindset / realization has been helpful for me this year. What do you think? 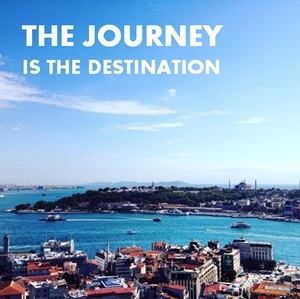 What’s your journey this month? I couldn’t have agreed more. The journey is certainly the destination and I think we all should start seeing life that way. Yes, I can also relate very well to this. I once sat with a man whom I know is very wealthy. This man has lots of companies. Talk about money….. He has lots and lots of it. But when I was discussing with him, he made a comment that wow me. He said that…WHEN HE MAKES MONEY….. I now asked him what he meant by that because it’s obvious that he already has money and he said nooo, that he don’t have money yet. Inside me, I was imagining the amount he want to have before he will become satisfied and the answer is that human are insatiable. We all have such spirit. If you have 100, you’ll be looking for 1000 and when you’ve made the 1000, the next will be 10000 and it goes on like that. So it will be hard to see someone tells you that he has arrived. But like you rightly said, let’s just see the journey as the destination. BTW Nick: You promised me that you’ll publish another interview that will interest me here, when is it coming up? Thanks Theodore. I think that episode is airing next Thursday. I read this because as a driving instructor I tell students and parents something similar all the time in discussing focus. Thanks for encapsulating the idea for me.